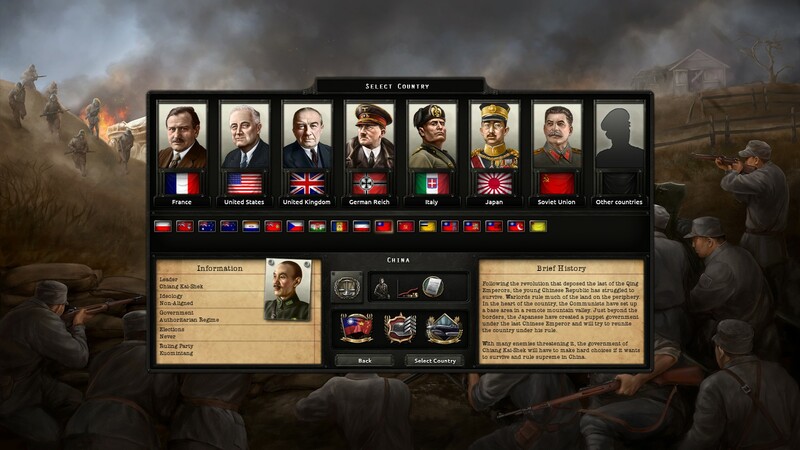 I’ve dabbled in Hearts of Iron IV now and again since launch, a game which was great at the time, but lacking some of the polish I would have wanted to see to give it a Red Mist. The game has evolved nicely over the past two years thanks to the Paradox style of releasing paid expansions to coincide with extensive free updates. To get the most out of the game at this point, you tend to need to dive into the paid expansions, but the 1.5 update that accompanies Waking the Tiger offers some welcome quality of life improvements to the UI, along with decisions which add a much welcome layer of dynamism to the game. Each major update to the game has tweaked the UI in some way or other, but 1.5 makes the production interface much easier to navigate for countries with plenty of capacity to build equipment. A simple thing, being able to collapse the view to show the bare minimum for each production line makes a world of difference. Along with new filters, no longer are you stuck having to scroll through an ever-expanding list to realise that the aircraft carrier you want to build, hasn’t started construction because you didn’t assign any naval yards to it. A small tweak, but one that I am pleased to see. Plenty of interesting countries are at your fingertips. The biggest shakeup to the game as part of 1.5, and perhaps since launch, is the new decision system. I have no doubt that other, more combat focused players out there will cry out that new planning tools introduced in previous updates are more impactful, but decisions add something that I felt was missing from the base game. While you could always follow your own path, changing your political system by influencing the public through political advisors and exploring the nation focus trees, it all felt somewhat prosaic. The focus trees were, and still are, set in stone from the start of the game. But decisions allow you greater control over your own destiny and serve to bring together your behind the scenes political machinations and your choices on the national focus tree. Even with a small nation, there are numerous options. As Ireland, I wanted to reclaim Northern Ireland, and had a goal of conquering Britain. It was never going to work out, but to have a chance, I needed to move Ireland away from democracy. I chose a political advisor with fascist tendencies to start me on the path. Soon enough, the decisions menu gave me two choices, move towards civil war, or let democratic elections take their course. I could have crushed my own fascist uprising by banning all fascist parties, but I didn’t. On the road to facism, the options are limited. As fascism takes hold, the options become more varied. As the fascist feelings in the country rose, I had a greater range of options to choose from. They all cost political power, so choosing wisely is important. I could get the people on my side or focus on ensuring the army was with me in my goals for turning the country towards a dictatorship. 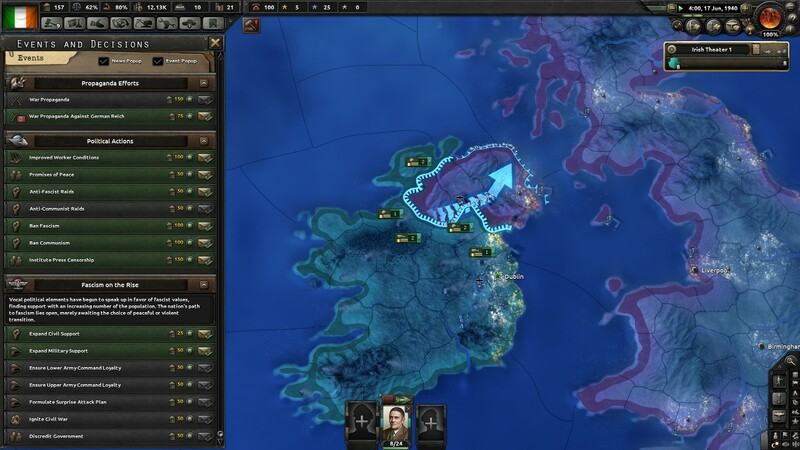 I chose the aggressive option, which naturally led to a civil war, with the democratic Irish rebels joining the Allies. Soon enough, my dreams of conquering Britain were dashed in a crushing defeat. Oddly, having joined the Axis faction, the game is continuing, even though I have no units, no land, but I can still carry out research. It’s bizarre. Anyway, for a small country, the decisions system adds a whole new dynamic to the action. It evolves as your game does, and really allows you to personalise what you get up to during the war. While I am still somewhat disappointed that the national focus trees don’t evolve over the course of the way, decisions go a long way to making up for it. As does the suite of countries who now have dedicated national focus trees, if you have bought the expansions that is. The old British dominions (Canada, South Africa, India and the ANZACS) arrived in Together for Victory, swathes of eastern Europe arrived in Death or Dishonor, while Waking the Tiger put a renewed focus on the forgotten part of World War Two – the Chinese front. Before war erupted in Europe, Japan had already invaded Chinese territory. The latest expansion grants the varying Chinese factions their own dedicated focus trees, and associated decisions. 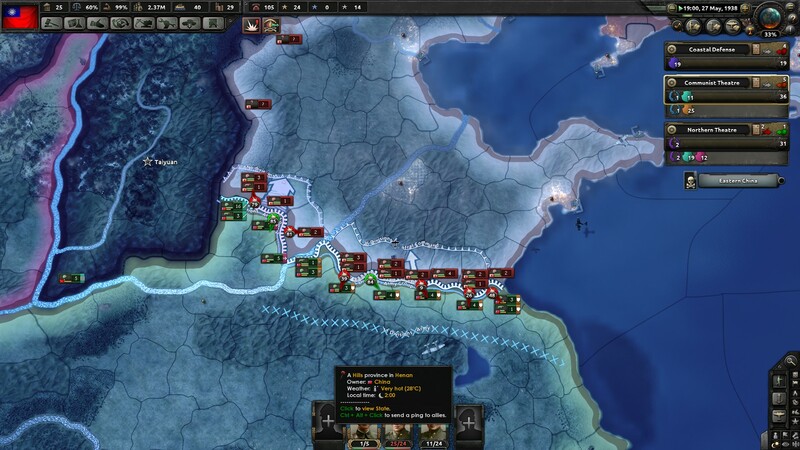 Taking on the might of the Japanese empire is one that you must be prepared for, with China split, bringing the country together is one goal, or you can try to take control of the country by force. Japan starts their invasion. I’m dooooooomed! I’ve made a start to a game with national China, bringing the Communist faction, and other warlords together in a unified faction. However, the power of the Japanese forces is quite awe-inspiring. My tactical skills are somewhat lacking compared to the AI, I might have to start more games on the new Casual difficulty to keep me out of trouble. Trouble is what followed me in Germany. Another part of the Waking the Tiger expansion is updated focus trees for Japan and Germany. They both offer routes away from the fascist dictatorships, but they probably won’t be easy. In Germany, I quickly launched a junta led by the old army types, and seemed to make good progress in northern Germany, taking charge of Berlin in the early days of the civil war. My military command wasn’t as good in the south. After Hitler killed himself in his bunker in Berlin, Himmler took charge and led a resurgence from Munich. My civil war was soon over. 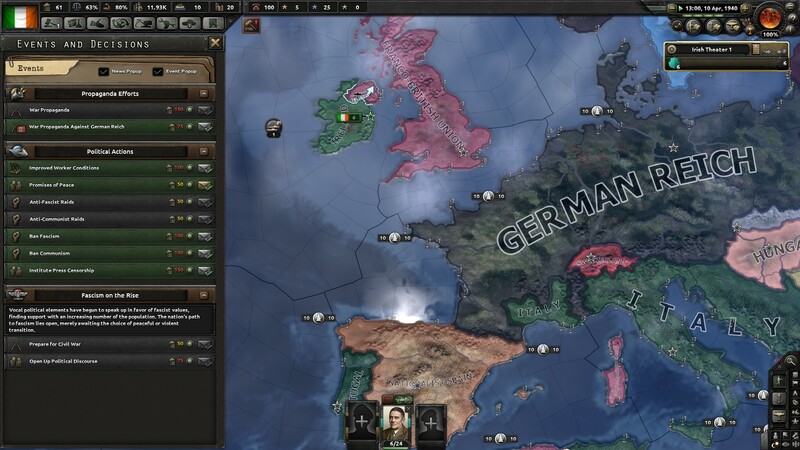 Hitler died…but so did my aim of a free Germany. What I have seen in the last week is a Hearts of Iron that feels as fresh as it did when it launched. The regular free updates have kept the game ticking over, offering something for the armchair generals and political schemers alike. The expansions have rightly introduced a wider range of interesting nations to play, each with their own unique national focus trees to work through. More of these would never go amiss, but if you play your cards right with a smaller country, the decisions will ensure you still have a fun game.